Australian TV presenter, blogger, journalist, New York Times bestselling author…bike-loving Sarah Wilson. If I had a dollar for every time I’ve been asked how I manage my autoimmune disease I could buy a small island. I’m happy with my two-bed flat, so I’ll share my experience and tips and philosophies on it all here for free. I’ve been promising this for ages: a rundown of what I’ve done to get on top of my Hashimoto’s (hypoactive thyroid disease), and to throw in some advice from practitioners I’ve turned to for help. * If you don’t have autoimmune disease, you’ll still find this interesting. 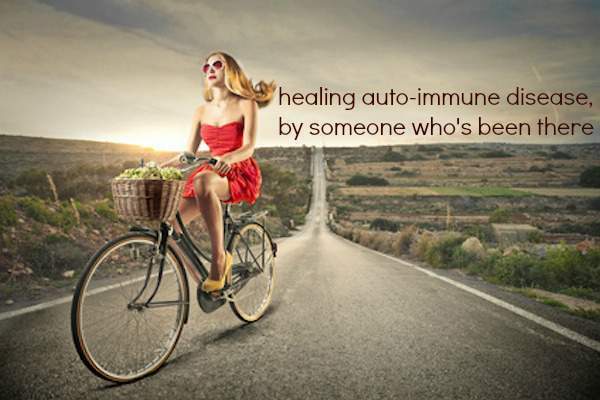 IMO, autoimmune sufferers are the proverbial canaries down the mineshaft. Our symptoms are signals of what our lifestyles are doing to all of us, a reflection of the over-toxic, hyper-adrenal, sugary, sleep-deprived, anxious lives we’re living. Again, IMO, Autoimmune disease types have particularly sensitive systems – for a whole range of reasons (hereditary, trauma-related) – and so we tip over the edge more easily. The ret of the world should see us as nifty warning beacons and heed our lifestyle tips! * The below is advice I’d give to myself, if I could go back five years, to avoid the very bumpy journey I’ve had to ride toward a better understanding of the disease. I’m not giving advice to anyone else. Really, I aim only to inspire you to ask questions and find what works for you. And that’s the thing – there is no one cause or fix. Also – and this is the blessing – in the searching for your own answers, you come to learn a lot of really important stuff about yourself…that you’ve wanted to find out for a long time. Which is why you got sick…More on this below. Finally, I refer directly to Hashimoto’s, but much of the thinking applies equally to other AI diseases. Okay, so here goes. I’ll do it as a Q and A for ease. What’s this autoimmune caper about? Autoimmune disease is a condition that sees the body attack its own cells, resulting in a colourful array of diseases, including Crohn’s and rheumatoid arthritis. It’s said to be among the top ten causes of death for women under 65. I first got the condition at 21 in the form of Graves disease (a hyperactive thyroid). Thirteen years later (at the end of 2007) it switched to Hashimoto’s (an underactive thyroid). It often goes this way. A bit like a star that burns too brightly and eventually implodes. I put on 12kg in a matter of months. Which was hard, given not long after I was plonked on a national TV show with 4.5 million Australians watching. Thankfully it was a show about food. And my co-hosts were chubby! I’ve lost that weight since then. To be sure, Hashimoto’s is not a kind disease to the female ego. Other charming symptoms: my hair thinned, my nails flaked off to the nail pit, and I got to a point where I couldn’t walk. I’d stand and fall over. Oh, yes, and I got depressed. And inflamed. I HATE the inflammation. On “thyroidy” days, my right side swells up and tingles. My lips feel like they’re burning. I still get this when I overdo things (don’t sleep enough, do a little too much exercise or eat certain foods); it’s like a little red flag that tells me to back off and look after myself. I also still get very tired some days and find it hard to move about. Again. Helpful red flag. I also lost all my female hormones and my periods stopped, which caused a bunch of other issues (brittle bones and, oooooh, mood fluctuations), and got me real worried I’d never be able to have kids. I lost the outer third of my eyebrows (weird, but quite common). I now have to pencil them in. The weirdest little theory I’ve developed? A blood test, which found my TSH (thyroid stimulating hormone) levels were off the richter scale, which indicates my poor little system was frantically trying to jolt my thyroid into action (by stimulating it with TSH to produce thyroid hormones), not realising it had shut up shop. TSH levels are meant to be between 0.5 and 2.5 (or thereabouts; there’s a lot of discussion on this topic). Mine was at 85. I was put on Thyroxin. I’m going to say it bluntly: endos are good for getting the basic tests done and issuing prescriptions. But most, I’ve found, are so Western in their thinking that they don’t want to help further. It’s not in their interest to. They have a pill they can give you, which is meant to abate the symptoms, so don’t bother to look at what’s causing the lack of hormones in the first place. There are no concrete answers, so they don’t like to help you delve because the lack of certainty makes them uneasy. They apply a Band-aid only. This is my experience only, of course. There is much debate about whether it’s better to take straight thyroxin or a version that has both T4 and T3. The former is produced by the big pharmaceutical companies. Ergo, you’ll find most doctors and endos will push this course. In Australia the latter you have to get made up by a compound chemist and a lot of doctors remain skeptical about its worth. The inclusion of T3 in the compound version is because not all people with hypothyroidism can convert T4 effectively to T3 (which you need for thyroid balance), largely because when you’re so adrenally exhausted and your immune system is under pressure you just can’t. Which brings me to my next point. Research and ask questions. Fact is, no one really knows what causes AI and how to fix it. So you have to develop a wellness plan for yourself. That is, develop a robust interest in managing your health, and all the practitioners you encounter, by reading, asking questions and trying out different approaches. I love GPs and I love herbalists… and the rest. But, boy, they’re a recalcitrant bunch; they rarely agree. Take it as given that it’s your job to coordinate them and their conflicting wisdoms to develop a routine best for you. Annoying. But true. I’d really recommend taking notes and keeping a wellness diary. I didn’t, but wish I had. What does my wellness plan look like? Don’t do dramatic shifts – they don’t suit our constitutions and make AI worse. Keep it soft, kind, gradual. Please, please be kind to yourself. It’s your abrupt, impatient, push-yourself-to-limits approach that landed you here in the first place. Healing will come when – and as – you learn to be kinder and gentler to yourself. This is good news. It’s time to treat yourself well. OK, so why did I get AI? I’ve arrived at a point where I know with all my heart I got AI because I needed to. Yes! I was burnt out and over myself. But I couldn’t stop (drinking coffee, knocking back half a bottle of wine each night, working 15-hour days, enduring the nastiest breakup in Christendom, not sleeping, striving and climbing higher because I didn’t think I was enough on my own…). It was a habit I was scared to break. I really wanted to live a different way. But I was worried that if I slowed down, everything would unravel. So I was forced to. The lifestyle changes I’ve had to make have changed my life. I’m happy these days. And clear. And for this I’m glad. * The first approach to work for me was alakalising my system. The western lifestyle has too much acid propping it up; too much sugar, alcohol, coffee, red meat and stress. Now consider this: cancer and autoimmune disease can’t survive in a system that’s been de-acidified, or alkalised. So it’s simple: cut out as much acid as is doable and eat lots of green veggies. * I drink a glass of red wine 4-6 nights a week. I’ll have a coffee 3-4 mornings a week. * I eat gluten-free. It’s easy. * The thing that has made the biggest difference though, is quitting sugar. This has had the biggest impact on my AI, more so than my medication or any other medical fix (and, trust me, I’ve tried everything). In the past few years, I’ve been able to better manage my AI, but also – yes – heal and reverse the damage. Next, I learnt to exercise less. Yes, less! Or at least less forcibly. Over-exercising causes a lot of “rusting” of our bodies. We don’t get told this. More exertion = more oxygen = more “rust”. I used to run a lot. Now I walk and do yoga and swim. Oh, gosh, you should. I did a sleep retreat and learnt how cell damage is repaired during sleep, but only once our bodies have attended to detoxing the crap we’ve put in it during the day. Ergo, put less crap in, and get at least 7-8 hours sleep so that the cell repair cycle has time to do its thing. When I don’t sleep, the next day my body is so inflamed. Many practitioners agree that autoimmune problems stem from – or at least can be healed from – the intestinal tract. My gut tends to agree with this. Some of my current gut health obsessions include kombucha, gelatin and stacks of fermented foods. You can find details and recipes on my site at sarahwilson.com. Well, what do you mean by fixed? I’m further along in my Great Undoing Of My Old Ways. Some days I feel great. I used to struggle 3-4 days a week. Now it’s down to about one day in ten… It’s a constant journey, that’s frustrating but rewarding at the same time. I have afternoon naps sometimes. I know myself better…it took this illness to drag me kicking and screaming to this point. But it’s where I wanted to go. I tend to take the bumpy path on most things. By way of a final word of advice: don’t take my word for it. Take your own and take control. Oh, and be kind to yourself. Always be kind. Sarah Wilson is a New York Times best-selling author, blogger, and wellness coach whose journalism career has spanned 20 years, across television, radio, magazines, newspapers and online. She’s the former editor of Cosmopolitan magazine and was the host of the first series of MasterChef Australia, the highest rating show in Australian TV history. Sarah is the author of the Australian and UK best-sellers I Quit Sugar and I Quit Sugar For Life. I Quit Sugar was released in the USA and Canada April 2014 and is a New York Times best seller. Her I Quit Sugar: 8-Week Program is available in Kindle and audible versions. READ NEXT: Does quitting sugar heal autoimmune disease? Everything I read says no wine with hypothyroidism. How do you drink it and coffee and not have issues? Do you recommend a certain kind of wine that is less issue? I’m wondering if it’s possible to be hypo if my THS is only 1.2? I have Hashimoto’s disease (including a lot of unfortunate symptoms- low energy, circles under my eyes, tingling in my legs and arms, difficulty losing weight, hair loss/breakage) and do not eat gluten. I take a number of vitamins prescribed by a hormone expert, however my endo insists that my thyroid is functioning normally based on my low THS. While I agree that my number is low, it has steadily raised from .30 over the past three years (since the birth of my first daughter). Any thoughts? I’m wondering if this resonates with anyone and/or if anyone thinks I could need thyroid hormone? This is literally me right now! My TSH used to sit at 1.2 and now jumped to 2.5! I have all of those symptoms too, and my doctor is still refusing to treat it right…working on finding a new doctor! My second question to this is that I’ve cut out all sugar except fruit. I really LOVE fruit so I limit myself to 1 serving a day, but should I cut all fruit out?